I’m not sure why trout key in on certain patterns, but I’ve had really good luck with a white marabou streamer. The streamer has done well for me on rivers such as the Swift and Quinapoxet. If you tied it in a larger size, I suspect bass will like it, too. 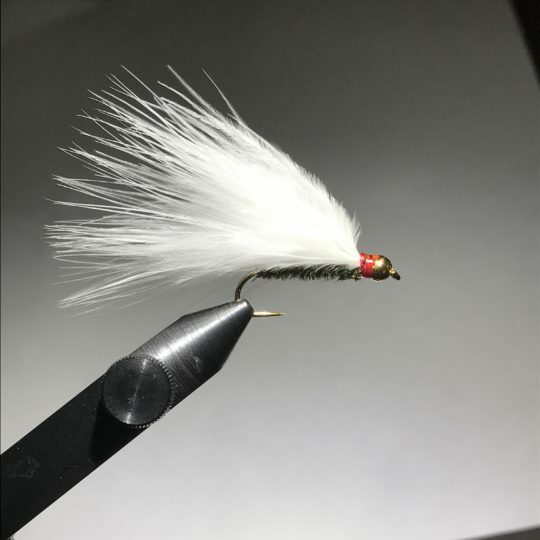 I like how the white marabou is easy to spot in the water. So, I can see how the streamer drifts. This can be critical. For example, I caught quite a few winter bows on the Swift with this pattern. In January, the trout were lethargic and I had to vary the swing and retrieve just so. Too slow and they lost interest. Too fast and they gave up the chase. Being able to see the streamer made all the difference. As I started fly tying, I’ve tweaked the fly over time. I tie it so that it is 2″ to 3″ in length. I’ve read that trout go for baitfish that are <20% their size. It’s hard for them to consume something bigger. So, I’m going for trout that are about 12″ in length, which is probably the average size for stockies. Google will come back with a PDF, and you open that found file showing high quality & general streams. Its a great tool to help find new rivers & streams. hat is awesome! Thanks for sharing that! A quick search with a few town names brought up a few streams I thought nobody but me knew of. And they have trout! Awesome streamer by the way Jo! I'll tie some up! I'm interested in tying this JT special, and it looks like the Peacock herl starts about half way or in the middle of the shank of the hook. Could you clarify? Actually, it goes on the whole shank. For some reason, in that picture, it looks otherwise. Sorry about that.